First Line: Mother and Father were sharing a bed. Things have changed greatly for Inspector Walter Day and Sergeant Nevil Hammersmith since the events that took place in The Devil's Workshop. Both men are still healing from their injuries, but while Day is confined to desk duty, Hammersmith is no longer employed by Scotland Yard. While Day contends with paperwork, being a new father, and his obnoxious in-laws, Hammersmith is obsessed with finding Jack the Ripper, who's still roaming free in London. Murdered prostitutes are turning up once more, and there's a new killer in town named the Harvest Man who has a particularly gruesome modus operandi with the husbands and wives he kills. No matter how hard Day, Hammersmith, and their colleague Dr. Kingsley work, the people of London may never feel safe again. 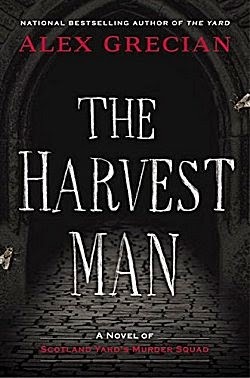 Any day with a new Murder Squad novel from Alex Grecian is a good day, and The Harvest Man is no exception. Scotland Yard is moving to a new building, and as the old one empties, there's a real sense of one era ending and a new one beginning. We're introduced to new characters, like Claire Day's parents, and we're able to observe how all of them are dealing with the brutal events of the previous book. Many things happened that are not easy to come to terms with. As usual, Grecian shows his skill in telling a well-paced, engrossing story. Jack the Ripper seems to have spawned a new breed of killer, and it's interesting to watch the characters speculate about the reasons why this is so. For anyone new to the series, I have three caveats. One, Grecian immediately immerses you in the story. There is little background given at first, so it may take you a bit of time to get your bearings. Two, if you are the slightest bit squeamish, the gore level in his books may be too much for you. Three, if you're looking for a perfect rendition of Victorian London, you may be disappointed. Grecian's London of the 1890s isn't necessarily a visual one; it's an emotional, a visceral, one. There are many other writers who can depict this London in all its grimy glory. From them you'll know by sight and feel and smell the second you step in horse dung as you cross the street. When you read Alex Grecian, you won't care about the horse dung because you're too busy mentally running for your life. There are many times when I was mentally running for my life-- or wishing that one of the characters would. Grecian knows how to tell that kind of story, and he's filled it with characters-- Day and his wife Claire, Hammersmith, Dr. Kingsley and his daughter Fiona-- that you care about. He raises the bar on suspense because, in his books, bad things can happen to good people. I'm not always in the mood for something like this, but when I am, I definitely know which author to read. But in the midst of all the running and lives being in danger, there are flashes of humor and of grace. These characters are people who know how precious life is. When Dr. Kingsley jokingly introduces his rudimentary crime scene kit to Inspector Tiffany, we laugh, but we also know how much these men care about stopping killers. When Hammersmith asks the names of women city fathers would cross the street to avoid, we're shown true humanity. When The Harvest Man ended, I found myself wanting to know what's going to happen to Walter Day. I look forward to Grecian's next Murder Squad book with a great deal of anticipation. Yep. I'm going to like this series.